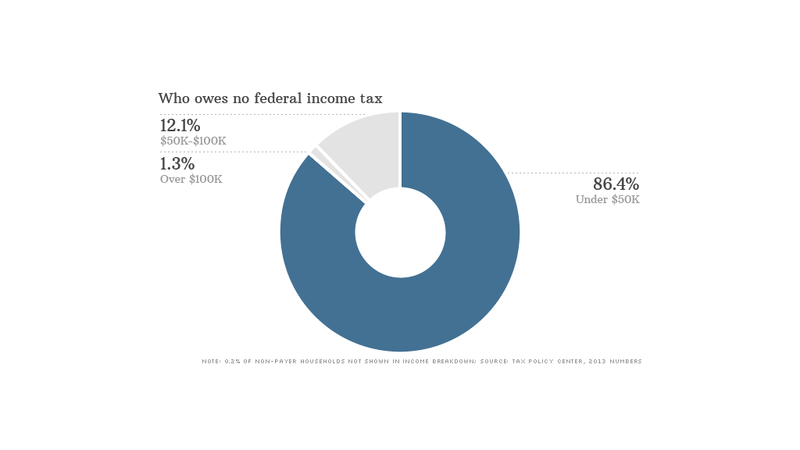 A little more than 43% of U.S. households -- or 70 million homes - will end up owing no federal income taxes for 2013. That's down from recent years because of an improving economy and the expiration of various tax cuts that were passed after the 2008 financial crisis, according to the nonpartisan Tax Policy Center, which published its latest estimates on Thursday. But that doesn't mean there aren't any nonpayers among high-income folks. The Tax Policy Center estimates that a little more than 1% of nonpayers have six-figure incomes or more. A misconception about those who end up owing no federal income taxes -- especially those with low incomes -- is that they pay no taxes at all. In fact, most pay payroll taxes to support Medicare and Social Security as well as sales taxes and state and local taxes. However, there is a subset of households that still end up with no liability when income and payroll taxes are combined. The Tax Policy Center estimates 14.4% of all households -- or 23 million -- fall into this group. "And two-thirds of them are elderly," Williams noted. The issue of Americans with zero tax liability is a politically charged one. Mitt Romney created an uproar on the presidential campaign trail last year after he incorrectly characterized this group as people who are "dependent on government" and "believe they are victims." Lawmakers, too, often complain about the issue, even though Congress itself boosts the ranks of the nonpayers by passing new tax breaks and failing to review whether the old ones still make sense. But there may be less fodder for heated rhetoric in the years ahead. The Tax Policy Center estimates the percentage of households without federal income tax liability will continue to drop, falling as low as 34% of households by 2024.